Whenever you run a report, a small green window will appear on the bottom right of the page. Click here to access your report (red arrow). The report will also populate at the top of the Reports page under Recently Generated Reports (circled in red). This report displays the balance for each family as of the selected date along with the most recent charges and payments. This report will show what payments were made, type of payment method, date and status (success, pending or failed). This report will show the invoices created for the specified range of dates. 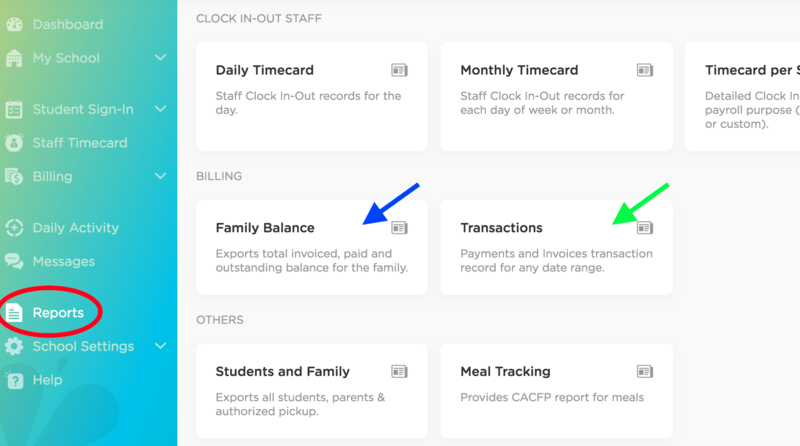 It will also display the current family balance.